University of California, Berkeley, astronomers have discovered the largest black holes to date ‑- two monsters with masses equivalent to 10 billion suns that are threatening to consume anything, even light, within a region five times the size of our solar system. These black holes are at the centers of two galaxies more than 300 million light years from Earth, and may be the dark remnants of some of the very bright galaxies, called quasars, that populated the early universe. Black holes are dense concentrations of matter that produce such strong gravitational fields that even light cannot escape. While exploding stars, called supernovas, can leave behind black holes the mass of a single star like the sun, supermassive black holes have presumably grown from the merger of other black holes or by capturing huge numbers of stars and massive amounts of gas. “These black holes may shed light on how black holes and their surrounding galaxies have nurtured each other since the early universe,” said UC Berkeley graduate student Nicholas McConnell, first author of a paper on the discovery being published in the Dec. 8 issue of the British journal Nature by McConnell, Ma and their colleagues at the university of Toronto, Texas and Michigan, as well as by the National Optical Astronomy Observatory in Arizona. 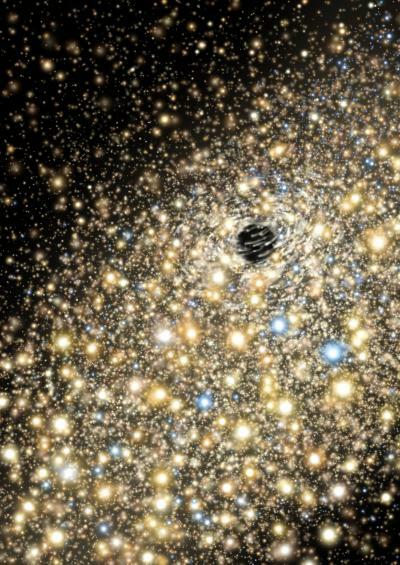 To date, approximately 63 supermassive black holes have been found sitting in the cores of nearby galaxies. The largest for more than three decades was a 6.3 billion solar mass black hole in the center of the nearby galaxy M87. One of the newly discovered black holes is 9.7 billion solar masses and located in the elliptical galaxy NGC 3842, the brightest galaxy in the Leo cluster of galaxies, 320 million light years away in the direction of the constellation Leo. The second is as large or larger and sits in the elliptical galaxy NGC 4889, the brightest galaxy in the Coma cluster about 336 million light years from Earth in the direction of the constellation Coma Berenices. According to McConnell, these black holes have an event horizon — the “abandon all hope” edge from which not even light can escape — that is 200 times the orbit of Earth, or five times the orbit of Pluto. Beyond the event horizon, each black hole has a gravitational influence that would extend over a sphere 4,000 light years across. “For comparison, these black holes are 2,500 times as massive as the black hole at the center of the Milky Way Galaxy, whose event horizon is one fifth the orbit of Mercury,” McConnell said. These 10 billion solar mass black holes have remained hidden until now, presumably because they are living in quiet retirement, Ma said. During their active quasar days some 10 billion years ago, they cleared out the neighborhood by swallowing vast quantities of gas and dust. The surviving gas became stars that have since orbited peacefully. According to Ma, these monster black holes, and their equally monster galaxies that likely contain a trillion stars, settled into obscurity at the center of galaxy clusters. Ma, a theoretical astrophysicist, decided to look for these huge black holes in relatively nearby clusters of elliptical galaxies as a result of her computer simulations of galaxy mergers. Astronomers believe that many, if not all, galaxies have a massive black hole at the center, with the larger galaxies harboring larger black holes. The largest black holes are found in elliptical galaxies, which are thought to result from the merger of two spiral galaxies. Ma found, however, that mergers of elliptical galaxies themselves could produce the largest elliptical galaxies as well as supermassive black holes approaching 10 billion solar masses. These black holes can grow even larger by consuming gas left over from a merger. “Multiple mergers are one way to build up these behemoths,” Ma said. 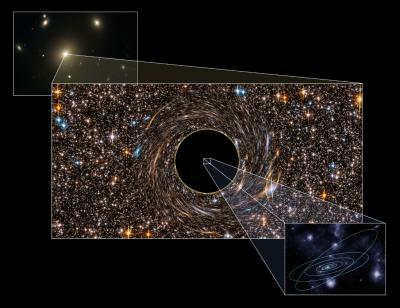 To look for these monster black holes, Ma teamed up with observational astronomers, including James Graham, a professor of astronomy at UC Berkeley and the University of Toronto, and Karl Gebhardt, a professor of astronomy at the University of Texas at Austin. Gebhardt had obtained the mass of the previous record holder in galaxy M87. Using telescopes at the Gemini and Keck observatories in Hawaii and at McDonald Observatory in Texas, McConnell and Ma obtained detailed spectra of the diffuse starlight at the centers of several massive elliptical galaxies, each the brightest galaxy in its cluster. So far, they’ve analyzed the orbital velocities of stars in two galaxies and calculated the central masses to be in the quasar range. Having such huge masses contained within a volume only a few hundred light years across led the astronomers to conclude that the masses were massive black holes. “If all that mass were in stars, then we would see their light,” Ma said. Modeling these massive galaxies required use of state-of-the-art supercomputers at the Texas Advanced Computing Center. Other coauthors of the Nature paper are Hubble postdoctoral fellow Shelley A. Wright at UC Berkeley and graduate student Jeremy D. Murphy of the University of Texas; Tod R. Lauer of the National Optical Astronomy Observatory; and Douglas O. Richstone of the University of Michigan. The research was supported by the National Science Foundation, the National Aeronautics and Space Administration and UC Berkeley’s Miller Institute for Basic Research in Science.